Q1: You're running on a policy platform that consists of one policy? A1: The first Policy 'Make it LAW that elected representatives in the Australian Parliament must vote as directed by the majority of voters in their electorates.' is key to all that follow. Without this policy in place it doesn't matter what the majority want it can always be over-ruled by parliament. All the other policies for the electorate are either proposed by the voters in the electorate ( as the elected rep is also a voter they can propose and vote a policy ) or are determined by the legislation that is scheduled to be voted on in the next session of parliament. Q2: How will you determine what a statistically viable sample size of respondents will be? Note that the VoteWrap method uses a variable consensus level because experience shows that as a policy becomes more important then a higher level of consensus is required for a stable result. If a policy is of high importance and you only get 51% then there is 49% of the constituency who will work to undermine the outcome. If the majority is higher then the opposition group become smaller and less able to undermine the result. Experience also shows that the less urgent a policy is then the more time there is available to build a greater consensus which again will increase the stability of the final result. Now to answer your question about determining a statistically viable sample size of respondents. 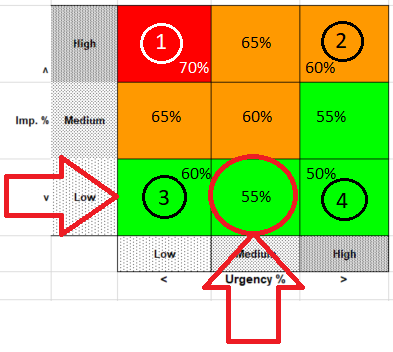 Using the example values of Importance & Urgency above we then read a similar matrix for voting compulsion. In this example the vote will be Voluntary and the sample size will be whatever the number of voters who care to vote for the policy. In the very unlikely event that nobody in the electorate care's about this policy then the elected representative can vote for what they think is best for the electorate. If the Urgency decreased and/or the Importance increased then the vote becomes compulsory and all voters must have their vote counted for it to be valid. It is impractical to get everybody to vote directly on every compulsory policy. But it is practical with a network of policy representatives collecting proxy votes from voters who don't have the time to be directly involved. These proxy votes can either be Directed, which means that the voter instructs the policy representative how to vote. Or they will be Open which means that the policy representative can cast the proxy however they see fit. At this point it is expected that there will still be many voters who haven't engaged with the policy either directly or by instructing their policy rep. This is where the network of general representatives will come into play. The policy reps will then engage with the general reps requesting them to cast their blocks of general proxy votes to build to the required consensus. So even if the vote is compulsory at say 65% it will in most cases not require 100% of all eligible voters to have either their direct or proxy vote counted. For example if 80% of voters have had their vote and that was enough to reach the 65% consensus then the remaining 20% of voters would not have to be counted. If a consensus isn't reached by the policy's deadline then the representative votes for the position with the most votes even if it is below the required consensus level. For example if 20% say No and 25% say yes then the vote will be Yes. A further point to note is that under the current rules of the Australian parliament only a 50%+ result is needed to pass legislation. So when the voters in the electorate are deciding what their majority position is on upcoming parliamentary votes they will use 50%+. 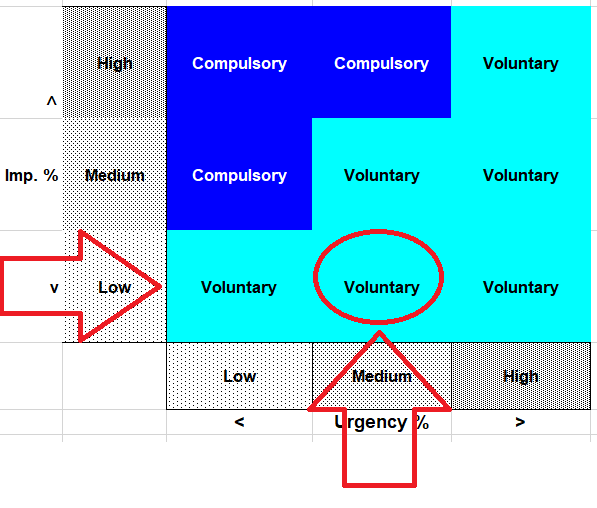 But the matrix position for Compulsion will still be used to determine if it is to be a Compulsory or Voluntary vote. Q3: Who will actually keep you accountable? A3: The voters & the representation of general and policy representatives will keep the rep accountable because they are the ones who are voting on the policies. In my case I have signed a statutory declaration saying that I will vote as directed by the majority so I say that makes me directly accountable. And if for some reason I did go against the will of the voters then I have declared that I would offer my resignation of I did. That has to be 100% accountability. Q4: How will it be enforced? A4: As I have legally committed myself to representing the majority of voters using the legal instrument of a Commonwealth Statutory Declaration if I fail to do that then I will be liable to serve a jail sentence of 4 years. So the Commonwealth ultimately will enforce my adherence to representing the majority Will. Q5: How do you plan to address that the ability of the electorate to ask questions is infinitely greater than one person's capacity to answer them? A5: Even with the best of intentions it is as good as impossible for one person to represent the 100,000+ voters in a federal electorate. The proposed solution to this dilemma is to establish a grassroots network of Policy and General Representatives. The Policy Representatives will be focused on individual policies brining to bear their respective knowledge and experience to deliver a majority position on each policy to the elected Representative. The General Representatives will use the proxy votes they hold to vote for policies that those who they represent have no interest in, or even awareness of. And using the VoteWrap method it is possible for thousands, millions or even billions of voters to be watching debates or receiving information via any channel relevant to the policy. As they individually vote their votes are aggregated to together in real time to give immediate feedback on each policy or policy element they are voting on. Q6: Thor Prohaska, what is your stance on immigration? A6: My personal stance is that the way immigration is being handled needs a serious change. There needs to be more focus on what is of benefit to the majority and less on what helps the corporations who donate to the political parties get cheap compliant labor. There also needs to be a much greater focus by the whole world on addressing the reasons people are fleeing their countries in the first place as that is the only long term solution to refugees. And the people who live in the communities where new comers are going to live should be part of the selection process of deciding who comes to their communities. However, if I was the member for Dickson I'd have to go through the process of determining what the majority in Dickson want before voting in parliament. Q7: Thor Prohaska, What is your stance on Qld base load coal fired power stations? A7: My personal stance on all coal fired base load power stations is that they should be phased out over their operational lifetime and replaced with renewable power sources providing baseload power with energy storages such as batteries and the Kidston Pumped Storage Hydro Project in North Queensland. For those local economies that are impacted by the closing of power stations they need to be properly supported to transition to alternative sustainable industries. During this transition phase in states such as Queensland where there are state owned generators no more power stations should be privatised as the record shows that privatisation of any existing public utility, especially where it is a natural monopoly, has never been to the benefit of the users. Q8: This is a dreadful idea. The general population doesn’t have the necessary training or education to make legislative decisions, it also doesn’t have access to qualified advisors like politicians do. Plus minorities need to be protected against mob rule. Just an awful awful idea. What is needed is politicians that will act in the true interest of all, and who are devoted to bringing about a better world. A8: You are right that we do need politicians that will act in the true interest of all, and who are devoted to bringing about a better world. Unfortunately that is exactly what we don't have because the two organised political mobs are playing political party games to get elected again instead of governing for the long term benefit of all Australians. They may have training, education & access to qualified advisors to make legislative decisions, but they frequently ignore that advice, and what the people are saying they want, and make politically expedient decisions that result in dreadful outcomes for the country and its people. The cynical manipulation of the Murray-Darling basin plan to give water to the big cotton irrigators resulting in the appalling recent mass fish kill would be a recent clear example. And how are they going at protecting minorities? Well I'd say not too well. The parties are more than happy to sacrifice minorities for base political gain. Look at how they treat the unemployed, the homeless and other at risk minorities. In a country as wealthy as ours no one should be homeless. And recent evidence I have seen shows that it costs more to the public purse to have people homeless than it does to provide them with suitable accommodation. That is a clear example of the parties ignoring evidence based advice. When I ask people in Dickson if they think their elected representative should represent what the majority want they overwhelmingly agree. I suspect that you haven't read my website to understand how I plan to address the very real issues you have raised. I do think that with 100,000+ voters in a federal electorate that there will be sufficient people with the skills and knowledge to come up with viable policy positions. And where a policy covers multiple or all electorates in Australia that all of the specific policy groups from all interested electorates will work together making the pool of expertise and knowledge even broader and deeper. Mob rule has always been a criticism of democratic systems. At the moment the mass of voters are not the mob ruling, it is the highly unrepresentative political parties and their donors. The mob rule dynamic coupled with group think is equally as bad in its own way. I believe the approach laid out on the Dickson Reps website will reduce the negative effect of mob rule to a level where it is no longer a problem. I could argue the pros & cons till the cows come home but that would be of little use if it isn't turned into practical action. Q9: Thor Pohaska, What is position your on bulk water charges. Over the last 10 years water has spiralled the same as power prices. Living in Dickson we have North Pine and Kurwongbah dams. The second was built by a private company and almost gifted to the old pine rivers council. A9: My personal position on the privatisation of our water supplies is that it should never happen. Water is a natural monopoly and a vital input into everybody's life. The outcome of water privatisation has only been higher prices to the end users. Q10: How will you preference on your 'how to vote card'. A10: My personal position on How To Vote cards is that every voter should decide their own preferences as it is they who send their preferences not the candidate. Every time I have stood as an Independent I have run an Open Ticket where I say Vote 1 for me and I have left all the other candidates blank. The only exception to this is that if any candidate signs the same 'stat dec' I have, legally pledging to represent what the majority want, then I will preference them. Unless a miracle happens that will rule out all the candidates who belong to a political party as when they join their party they pledge their first allegiance to the party. I'm reluctant to declare who I will personally preference as it will then be taken as my How To Vote position which defeats the purpose of an open ticket. I can say I will be ordering my personal preferences by who is most likely to represent what the majority in the electorate want. Q11: What is your position on Guns. A11: My personal position on guns is that I support the current gun laws, especially the bit about military style semi-automatics. I grew up in a town were guns were common. Our household had two 303s & a shotgun where the guns & ammo were not locked up and I as a kid had access to them. Nobody in my home town when I was growing up was murdered by a gun. To think that it is only gun laws that prevent gun violence in my opinion is too simplistic. As important as it is to have effective gun laws it is equally or even more important to have a healthy society where people have the basics they need to be part of society and don't feel marginalised. Q12: What is your position on Tax. A12: My personal position on tax is that the current tax system is dysfunctional, regressive and reduces real wealth creation. I support the tried and proven historical method of raising community revenue via land valuations. For more info on this see Prosper Australia's Policy. Historically all sides of politics have at one time or another supported this method. Examples are Winston Churchill, Albert Einstein, Walter Burley Griffin and Alfred Deakin. More recently John Howard & Price Waterhouse Coopers have supported this idea. However, the big landholders have always fought this tooth & nail. See Professor Mason Gaffney's book The Corruption of Economics. Q13: What is your position on Jobs. A13: My personal position on jobs is that we should replace the welfare system ( for those people who are capable of working ) with the Australian Job Guarantee ( Note: The CofFEE website is being upgraded and this link should be working by the 19 April 2019 ). This is a tried and proven strategy developed by Professor Bill Mitchel from the Newcastle University's Centre of Full Employment & Equity . Overseas governments have taken this research and applied it in their countries but for some reason the Australian governments have refused to acknowledge the practical benefits of this strategy. I say it is madness to pay people to do nothing, or worse to make them chase their tails looking for jobs that aren't there and jump through unnecessary mutual obligation hoops. The simple fact is that if people work to create wealth there will be more to go around. And these jobs by creating more wealth help to pay for themselves. If it is good enough for the federal government to be the Lender of Last Resort to the private banks then i say it should be good enough for them to be the Employer of Last Resort.